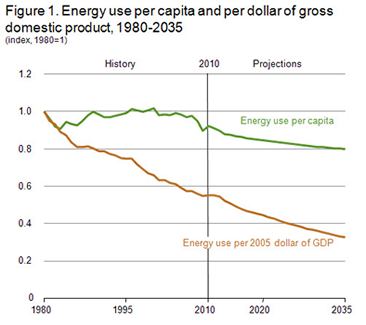 Here we continue our look at the DOE EIA’s projections of U.S. energy consumption through 2035. In this post we look at what they foresee happening in the commercial sector (essentially composed of offices and stores). Almost immediately we encounter issues that can leave us scratching our collective heads, especially when we compare what is written about this sector with what we have discussed earlier regarding residential energy consumption. According to the Department of Energy, energy consumption in the commercial sector will increase from 18.3 quads in 2011 to 21.5 quads in 2035, a CAGR percentage of 0.67. Certainly I hope they’re right–that a 25% increase in population, a doubling of GDP and a 26.9% in new commercial floor space will only result in an 18% increase in energy consumption. But as with residential and transportation, it means everything has to go right–that we will double the rate by which we improved energy efficiency over the past two decades. More than a quarter (26 of 98 quads) of our energy consumption in 2011 was for transportation. The vast majority (64%) was for light duty vehicles–the family cars. This was followed by heavy duty vehicles (19%), air travel (10%), marine (5%) and rail (2%). The U.S. Department of Energy’s Energy Information Administration predicts that energy consumption for transportation will grow at an annual rate of 0.1%, from 27.6 quads to 28.6 quads. This is revised downward from their 2011 estimate of growth at 0.5% to 32 quads in 2035. In my previous post I charted their assumptions for macro-economic drivers (population increase at 1% annually, GDP growth at 2.5% annually, 25% growth in household formation), all of which made me skeptical that the EIA could be ultimately correct about residential energy use. All of those factors apply to transportation as well. But there are other factors at play in the transportation sector. Legislation mandates improvements in gas mileage for light duty vehicles (LDV), which the EIA duly notes. They forecast energy consumption for LDVs to drop 3.2% overall between now and 2035. But the better mileage is only one of the reasons they cite. The other is that they believe personal travel demand will rise more slowly than in recent decades. I can easily believe that fuel efficiency will climb to comply with the law. There’s plenty of room for improvements and the government’s attempt to shift to measuring greenhouse gas emissions as opposed to fuel consumption may accelerate that trend. But the EIA offers absolutely no evidence to indicate why they think personal travel will grow more slowly. Population change doesn’t slow down. GDP grows at 2.5% per year. In fact, in their section on residential energy consumption they postulate something like a mass migration to warmer and drier climates as a reason why space heating will decline. But such a migration in the past has entailed vigorous personal travel as people return to visit the families they left behind. Perhaps more significantly, with more domestic oil being brought to the surface, with growing numbers of cars converting to natural gas or hybrid- and all-electric status, someone is going to have to explain to me why prices at the pump will not become less of a factor in determining the utilization of vehicles. This is in sharp contrast to the EIA’s forecasts, which see a real increase in prices of 48% for gas between now and 2035. And even though they predict personal incomes will rise by 81% during the same time frame, $5 a gallon gas would probably moderate driving just a bit. But is that realistic? The EIA’s figures strongly suggest that Americans will drive their light vehicles almost 1 trillion more miles in 2035 and use 3% less gas. I don’t see it happening that way. I think they were thinking more clearly in their 2011 estimates. What Doesn’t Add up in the DOE’s Energy Consumption Estimates? On April 26, 2012, the acting administrator of the DOE’s Energy Information Administration, Howard Gruenspecht, gave a presentation to the Institute of Clean Air Companies. Working from reference case for the U.S. Annual Energy Outlook for 2012, Mr. Gruenspecht highlighted some of the very issues that have me asking questions about the feasibility of achieving the Reference Case’s forecasts, which show American energy consumption rising at a very low rate of 0.3% CAGR through 2035–from 98 quads last year to 107 quads in 2035. Both the slides from his presentation and the AEO2012 report rely heavily on increases in energy efficiency to overcome other trends that would seem to drive energy consumption higher. In regards to the last bullet point, U.S. residential energy intensity declined only 9% from 1980 to 2005–and the easy wins for energy efficiency come first. It gets tougher after the low hanging fruit have been picked. The population will grow by 25% over the period covered by this report, from 311 million to 389 million. The country’s GDP will almost double, to $24 trillion in 2005 dollars. More houses. More people. Larger houses. More income to spend on energy bills. It’s going to take a heckuvalot of energy efficiency to counter that. I don’t see it. Next we’ll look at transportation. Guess I’ll have to do my own. In my last post I noted that the DOE thinks growth in energy consumption will average 0.3% per year, despite a 25% growth in population and an almost doubling of GDP over the same period. 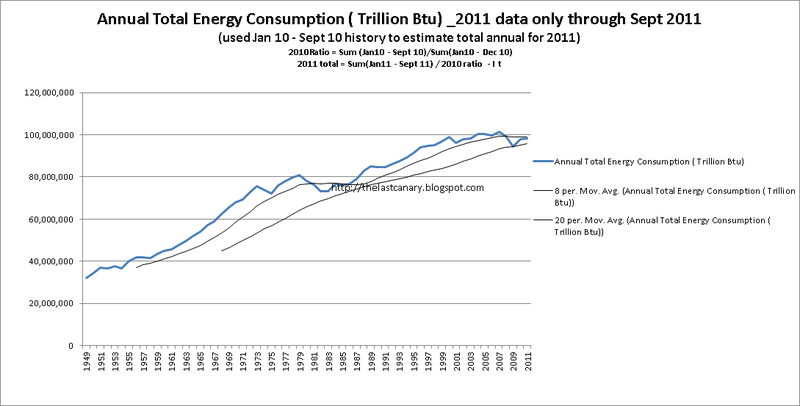 I’m referring, of course, to the DOE’s Annual Energy Outlook 2012 With Projections to 2035. It would take heroic performance and restraint–I called it winning the Green Trifecta previously. Let’s look at how the DOE thinks we’re going to get there. Later I imagine I will have a bone to pick with them regarding both their estimates of GDP growth and the impact of population growth. But let’s park those for the moment and look at more specific mechanisms for moderating energy consumption. New greenhouse gas (GHG) emissions and fuel consumption standards for medium- and heavy-duty engines and vehicles, published by the U.S. Environmental Protection Agency (EPA) and the National Highway Transportation Safety Administration (NHTSA) in September 2011. California Assembly Bill 32 (AB 32), the Global Warming Solutions Act of 2006, authorized the CARB to set California’s GHG reduction goals for 2020 and establish a comprehensive, multi-year program to reduce GHG emissions in California. As one of the major initiatives for AB 32, CARB designed a cap-and-trade program that started on January 1, 2012, with the enforceable compliance obligations beginning in 2013. After 2020, growth in manufacturing output slows due to increased foreign competition, slower expansion of domestic production capacity, and higher energy prices. Even as standards for building shells and energy efficiency are being tightened in the commercial sector, the growth rate for commercial energy use, at 0.7 percent per year, is the highest among the end-use sectors, propelled by 1.0 percent average annual growth in commercial floorspace. In the residential sector, increased efficiency reduces energy use for space heating, lighting, and clothes washers and dryers. In the transportation sector, light-duty vehicle (LDV) energy consumption declines after 2012 to 14.7 quadrillion Btu in 2023 (the lowest point since 1998) before increasing through 2035, when it is still 4 percent below the 2010 level. Total delivered energy use in the residential sector remains relatively constant from 2010 to 2035, but a 27.5-percent growth in the number of households reduces the average energy intensity of each household. Most residential end-use services become less energy-intensive, with space heating accounting for more than one-half of the decrease. Population shifts to warmer and drier climates also contribute to a reduction in demand for space heating. Portions of the Federal lighting standards outlined in EISA 2007 went into effect on January 1, 2012. Over the next two years, general-service lamps that provide 310 to 2,600 lumens of light are required to consume about 30 percent less energy than typical incandescent bulbs. High-performance incandescent, compact fluorescent, and light-emitting diode (LED) lamps continue to replace low-efficacy incandescent lamps. In 2035, delivered energy for lighting per household in the Reference case is 827 kilowatthours per household lower, or 47 percent below the 2010 level. We’ll go into all this in detail over the next few posts. There’s more about all of the sectors and I’ll probably spend at least one post on each sector. My preliminary take-away from all this is that if you postulated any one of these to me I would say it’s well within the realm of possibility. However, if anyone were to tell me that all of these were sure enough bets to make policy decisions on, I would start to shake my head in dismay. That’s more than a Green Trifecta. It would be like winning the lottery on successive days. One thing that is not explicit in the report but seems to really drive a lot of their thinking–a core assumption seems to be that energy will get more expensive–expensive enough to justify the wholesale changes they are predicting. Before we try and do any serious thinking (and while my brain still is recharging after my recent project), let’s look through the Department of Energy’s report, Annual Energy Outlook 2012 with Projections to 2035 and get the numbers racked up. Let’s start with macroeconomic figures. The DOE’s Reference Case (the center projection on which they base their analyses, by and large) shows the U.S. GDP growing from $13.318 trillion in 2011 to $24.539 trillion in 2035, a growth rate of 2.5% (those are all in 2005 dollars, btw). As they forecast consumption growing at a slower rate–2.3%–they apparently don’t think we’re going to go out and spend all that extra money. Well, they’re certainly not going overboard with enthusiasm about our future. A 2.5% growth rate is low. It’s not out of line with what others predict about our future, mind you. But for example, 2010 had growth of 3% and I don’t think anybody was thinking we were utilizing all our economic capacity that year. In fact, U.S. GDP was higher than 2.5% in 5 of the last 10 years, according to the U.S. Department of Commerce’s Bureau of Economic Analysis. And I’m starting to notice some things that bother me. The next thing I want to check is population, which is normally the most significant driver of energy usage. But although they say on page 25 that they project U.S. population to increase by 25% over the period covered by their report, they don’t give a total or the reference number that the 25% is added to. And I see that happening throughout the report–percentages without base numbers. They didn’t do that in prior years. This troubles me. But okay–the U.S. Census Bureau’s mid-year estimate for 2011 was 311,591,917 and a 25% increase would be 77,897,979 for a total of 389,381,896. That’s a growth rate of 0.93%. So when I get back into thinking mode, my first question is likely to be, if you think population is going to grow by 0.93% annually and you think that GDP is going to grow by 2.5% annually, is it realistic to project (as the report does) that energy will grow by 0.3% annually? Look at the above numbers. Income increases from $13 trillion to $24 trillion. Population increases from 311 million to 389 million. And the DOE is telling us that energy consumption will grow from 98 quads to 107 quads. That’s a whole lot of non-consuming going on. Well, I’m sure I will see the light after some July rest and relaxation.